This morning I was racking my brain trying to come up with my next post for NVTBL. I don't often have to think too long or hard to write about baseball. I've watched so many hours of youth baseball, driven so many carpools, endured so many extra innings, and washed so many jerseys that I'm pretty sure I'll never run out of stories to tell, thoughts to share, or experiences to impart about my boys, their teammates, their coaches, and all of the wonderful memories we have made on the ball field. Having watched my boys play from the age of 5 to the age of 18, I'd contend that each season has its positive points. But without a doubt, I'd suggest that if you're having a bad day, you ought stop by a t-ball field anywhere in these United States and take a look. If you don't start giggling within minutes, you might want to check your pulse. Interestingly, this morning when I was thinking about t-ball, it wasn't the memory of a little boy with cleats full of rusty dirt and a sticky gatorade mustache that popped into my mind. 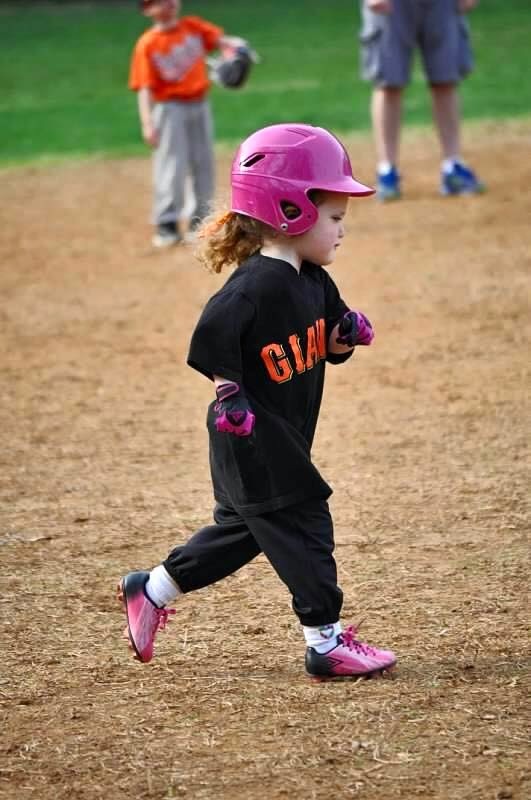 Instead it was that of a curly-haired, pink-cheeked little girl whose pony tail bounced perfectly behind her as she ran the bases in her very first ball game almost four years ago that is burned in my memory. That little girl's name is Sabrina and of all the t-ballers I've watched play, she was my favorite. 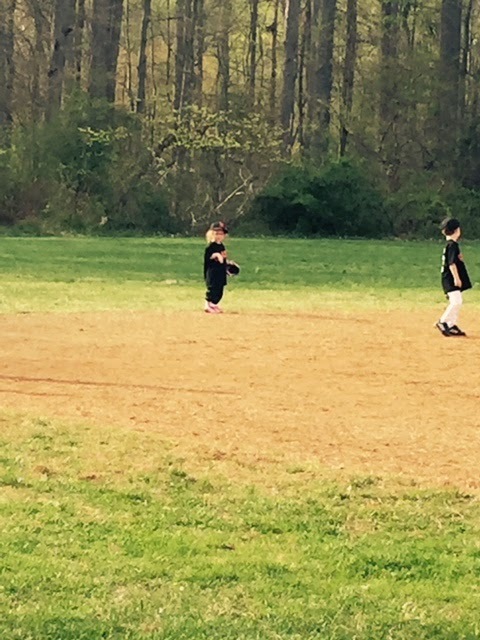 A shoo-in for the T-Ball Hall of Fame, if you ask me. She is now eight years old and today, January 24, 2019, she celebrates 5 years of being cancer free. I've often credited the game of baseball with bringing amazing friends and people into my life. This is true of my meeting Sabrina and her family as well. Hers is a story that is harrowing and difficult, but ultimately triumphant and joyful. 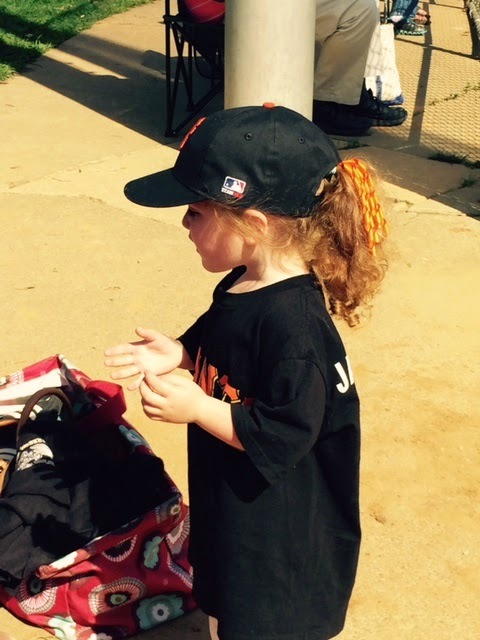 There is much that can be written about her, but today I dug up a piece I wrote about my very favorite day on a t-ball field to share with you. And Sabrina has a starring role. I think you'll find her as captivating as I do. Please enjoy and if you might, please send up a prayer of thanksgiving for this precious child whom we like to call "Miracle Girl". If you've read many of the pieces I've written in the past few years, you might have heard me mention a time or two that I am the lone, relatively small female in a house of full of four men - all who play or have played or coach or have coached baseball at some point in the past fifteen years of my life. That means that I've spent countless hours among smelly cleats and grass stained pants. And though I joke about the smell, the mud and the incessant ESPN, I believe I was made to spend my days among snips and snails and puppy dog tails. I adore my boys. I adore their buddies and have never once felt any deep sense of loss or absence in not having another girl in my home. As a girl who loves make-up and bubble baths and shoes and a good Kate Winslet movie, there are those times when I need a little sugar and spice and everything nice in my life. Saturday, after a long, tedious week of filling in practice and game schedules on my calendar, washing stains out of white pants, and buying cleats, athletic supporters and 327 gallons of milk, I found myself on the way to the third of seven baseball games that were on the schedule for the weekend. It was a beautiful day for baseball and I really was excited to sit down in my chair in the sun and watch my boys play. I also remembered that my little friend, Sabrina, and her mom, my friend, Christine, lived quite close to the park. Sabrina is a little girl who was diagnosed with cancer at the age of 16 months. Sabrina has kicked a little cancer booty of late. At the age of four, she is just about 18 months cancer free and she will be one of the Patient Ambassadors for my son's baseball team when we play in the Kyle's Kamp Memorial Day tournament to benefit pediatric cancer research at Children's National Medical Center. 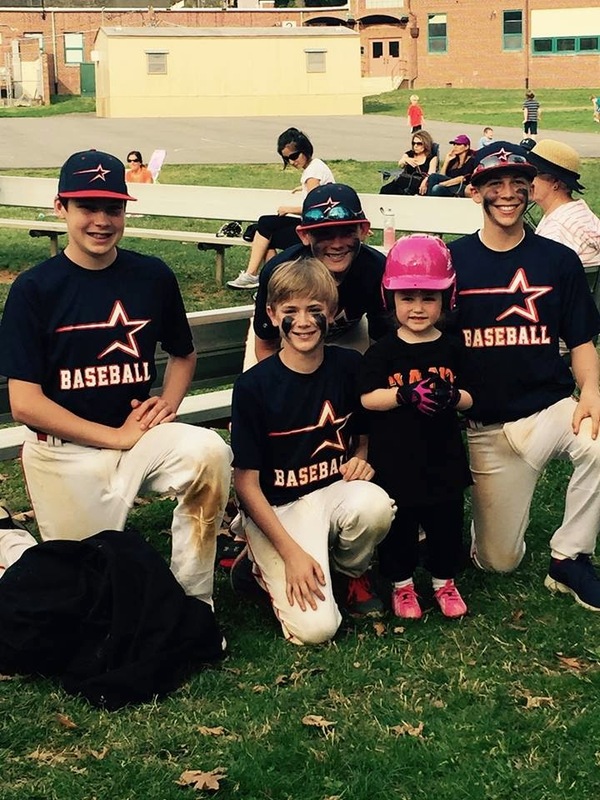 Sabrina came out to our baseball game on Saturday to meet the boys and coaches of the 14U Stars baseball team before the tournament next month. Before she arrived, our coach told the guys to be ready to greet her and make her feel welcome. There might have been a warning along the lines of try not to act like chuckleheads, guys. 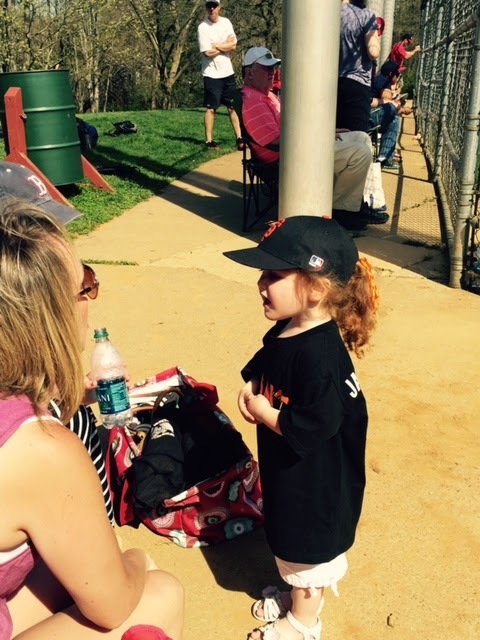 When Sabrina arrived, donning her Giants Little League jersey and hat, my son, Kyle, put his hand through the chain-link fence of the dugout and she grabbed onto his finger and held tight for awhile. So enchanted was my 14 year old, that I'm pretty sure he almost stuck her in his bat bag and took her home. 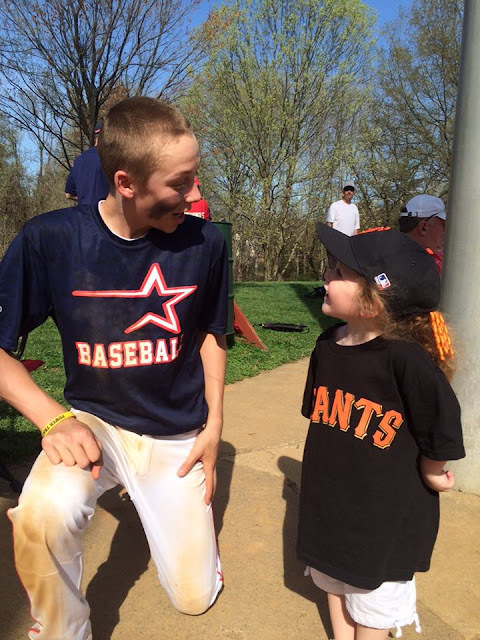 Kyle's teammate, Drew, grinned a million dollar smile at Sabrina as she told him she would have her first tball game later that day. Our catcher, Andrew, decked out in all of his gear, squatted down to meet Sabrina face to face and asked her if she'd like him to draw some black lines under her eyes to match the rest of the team. She politely declined, "No, thank you. I don't need that." Sabrina met all of the parents and coaches as well. She taught us Spanish words and discussed ballet and baseball. She skipped and smiled and sang a few Frozen songs for "Miss Jenn's friends". Girlfriend apparently had some things to say to "Miss Jenn's Friends". JUST SO MANY things to say. 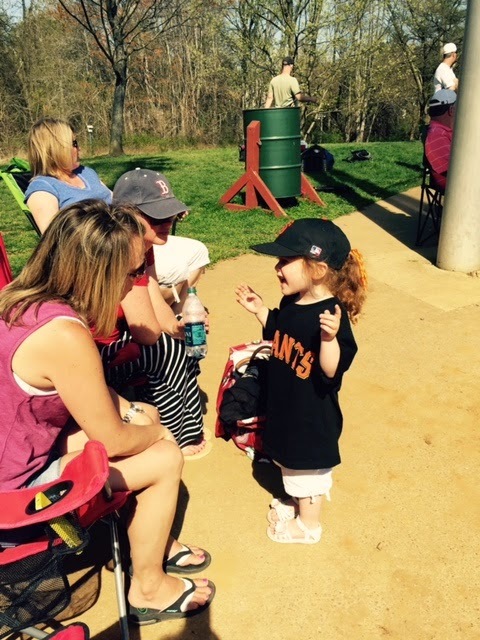 After the boys finished their game, a number of them decided that it was the perfect time to grab a Slurpee and head over to watch their favorite littlest Giant play her first t-ball game. Let me tell you something. There is nothing that will make your heart bust open wider than watching a group of rough and tumble teenage boys struck still and captivated by a little girl with bouncy curls and a baseball glove. And you know what else busts open a heart? It's when I realize that there is never a mistake in who God brings into our orbit. Sometimes He brings in people to help fill big, gaping holes. Sometimes we just have a little bitty hole that needs to be filled. I'm grateful that I don't have any big, gaping holes. The Lord has given me everything I need in this family of men. I am blessed beyond measure. But sometimes - not too often, but sometimes - the boyness overwhelms and there's a little gap that just needs to be filled up with a little girlness. A little bit of sugar and spice and everything nice. And some pink cleats just to keep it interesting. Congratulations to you, Sabrina, and to your brave family on this amazing milestone. The Northern Virginia Travel Baseball League salutes you today. We are grateful for your life, your triumph, and your courage. Play on, Miracle Girl.